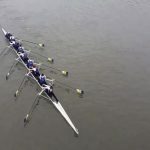 On the 10th of March, the Women’s Head of the River Race was held on the Championship Course from Mortlake to Putney over the distance of 6.8km. Early in the morning on Saturday, the senior women’s eight consisting of Jasmine Bone, Ellie Stevens, Anika Piezka, Megan Pearson, Maddie Gardner, Megan Moloney, Sophie Hossack and Fiona Norris went down to the Putney Town Rowing Club, located in Mortlake. Once their boat was rigged, they went out for a pre-paddle to get an idea of how the tideway was. 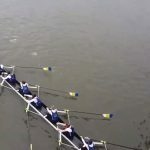 Coxed by Jonna de Vries, they had a strong paddle and took a lot of confidence out of the bursts that were done. The conditions were surprisingly nice and the whole crew was very excited to get to race. After an extended break due to the delay of the race start by 45min, our athletes were in great spirits and ready to race. With the starting number of 130 the crew got a short warm up in on the way down to marshalling. The weather conditions held up and only saw the wind pick up towards the start of the race. Once it was time to start, the crew had a strong build into the race which started just after Chiswick Bridge. Settling into a strong rhythm straightaway, they overtook the crew in front of them by Barnes Bridge. Nevertheless, they maintained their strong rhythm while marching through them. Supported by the rest of the squad and friends and family on the bank, the cheers gave everybody another energy kick. This led to overtaking another crew just before Hammersmith bridge. Once the bridge was left behind, the girls had a big push from the milepost onwards. Crossing the finish line 68th out of over 300 crews, and 14th out of 82 crews in the academic intermediate category, they achieved the best result any Surrey crew has ever been capable of. 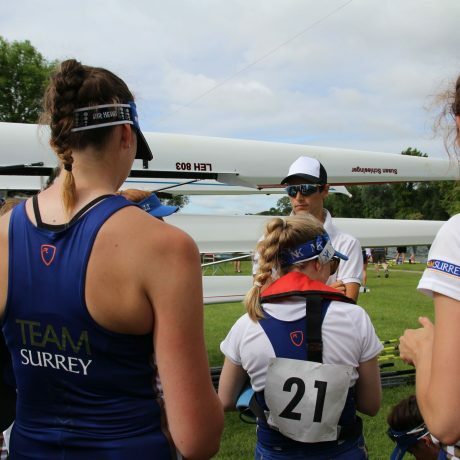 After arriving back at the club, they derigged the boat and had a review of their race with head coach Sam Tuck, who was very pleased with the result. Going forward, the squad is looking to build up on that performance and to take confidence out of the race.